Can I embed pictures on my shopping flipping flash catalog? Embedding images into a flash flipping catalog is a necessary skill in order to take advantage of the rich feature offering the clients much more information. Unlike other flipping software, Flip ShoppingBook Maker enables you to add images on any flip pages to rich the content so that you could obtain unexpected results on the sales of online marketing. 1 Start Flip ShoppingBook Maker, import a PDF form of catalog. 2 Click on Edit Shopping Cart, and then click on the icon of Add image. 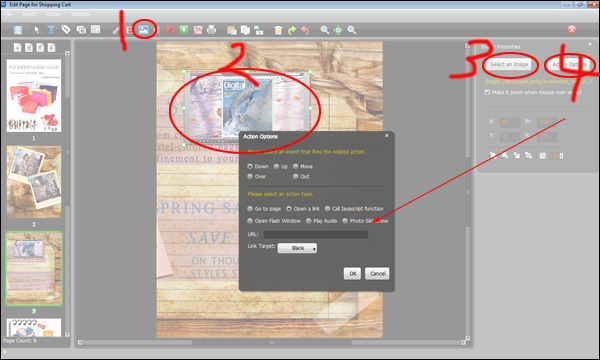 3 Draw an rectangle to place image on any page, and load in an image on the right editing box. 4 Click on Action Options to setup dynamic actions for the image.